Assyria (GB) Your browser does not support any audio element. Ancient landscape or area between the mountains of Armenia, today Iran (Persia) and the Syrian Arabian Desert. The present countries Jordan. Lebanon and Syria in the Middle East belonged to the immediate sphere of influence. The area included the northeast of Mesopotamia and the north of today Iraq, The entire area had a significant impact on the development of viticulture and wine culture. In the 17th century BC Assyria fought against the Babylonian king Hammurabi (1728-1686 BC) the independence, the capital was Assur. King Salmanassar I (1274-1245) conquered Babylonia, extended the Assyrian rule to the whole of Mesopotamia and founded the city Kalhu near today's Nimrud in northern Iraq around 1250 BC. Under Assurnasirpal II (884-858) Kalhu was elevated to the capital. In today's ruined site, clay tablets were found bearing wine rations for the ruler's 6,000-person household - the higher the hierarchical rank, the greater the ration and quality. 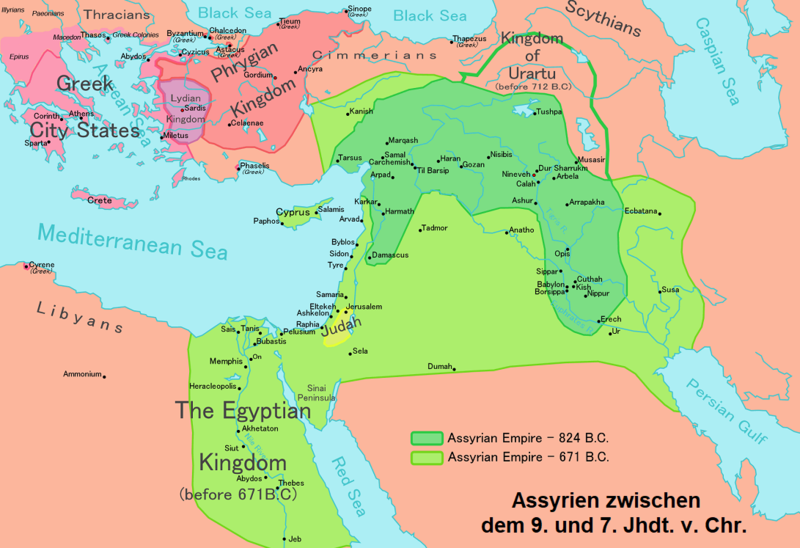 In the 9th century BC BC developed an Assyrian empire, which extended from the Persian Gulf to the Mediterranean. Around 800 BC The legendary queen, Semiramis, reigned supreme. King Salmanassar V. (in the Bible he is called Salmanazar - ruled from 727-722 BC Conquered 722 BC. Chr. The northern kingdom Israel and made it to the Assyrian province. The Assyrian king Sennacherib (705-681 BC) destroyed 689 BC. The city Babylon and made Nineveh the capital. King Assurbanipal (668-625 BC) had a large clay tablet library built, including the 1853 discovered texts of the epic about the Sumerian king Gilgamesh (2700 BC). The Babylonian king Nabupolossar (626-605 BC) overthrew the rule of the Assyrians and his son Nebuchadnezzar II. (605-562 BC) developed Babylonia again to the empire. In 539 BC BC, the Persian king Cyrus II (559-529 BC) conquered the Babylonian Empire including Assyria. This page was last modified at 18 February 2019 at 13:30.